Getting engaged is one of the most exciting things some people look forward to experiencing in their life. The idea that someone loves you so much that they are going to promise to spend the rest of their life with you is enchanting. Many people dream about how their significant other will propose to them and have an idea in their mind of how they would like it go. Your vision of this moment may involve your favorite place, your family, and the person you love, all celebrating this momentous moment. 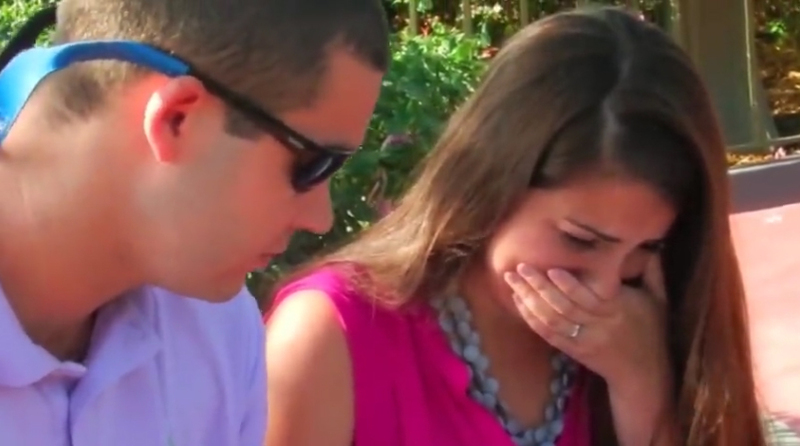 Here is a magnificent story about one girl’s perfect proposal. She was a Disney World fanatic, and he wanted to spend the rest of his life with her. In 2012, Clifton decided to propose to his girlfriend, Stephanie, and he really thought about every last detail. Through their mutual love of each other, and Disney, they decided to take a trip together to the happiest place on Earth. So with Clifton being eager to pop the question, he knew this would be the perfect, most memorable place he could do it. Where he was going to ask her to marry him in Disney World was a no-brainer — he wanted to make sure she had her Cinderella moment, so he knew he would take her to Cinderella’s castle and get down on one knee. First he started with a private note sharing his feelings and she got pretty emotional but that is only the beginning. He then got down on one knee and she was hysterical. You’d think he’s pulled off the perfect proposal, right? Wrong. It gets better! She was able to collect herself to call her family and tell them the wonderful news, when Clifton said “Steph, turn around.” She turned around to see her parents standing there. She screamed and just fell to her knees. Now THAT is the perfect proposal. This epic proposal was definitely one for the books but obviously each person, and each couple, has a different story and a different idea of what the perfect proposal would be. But in this case, there is no doubt how much they love one another and that Clifton achieved the perfect proposal for Stephanie. Who doesn’t love a feel good story that turned into a “happily ever after”?